Two filters are better than one, and when you include a combination Envelope Generator / LFO and interconnect them with a powerful normalization scheme the result is a filter system with unmatched versatility. A dual filter offers a lot of flexibility. It can be used as two independent 12db/oct. (2 pole) elements to achieve complex, dynamic timbres not possible with one filter, or the two sections can be cascaded for a single 24db/oct (4 pole) response. Each filter has Lo Pass, Band Pass, and Hi Pass outputs with nominal corner frequency (Fc) range from 16Hz. to 16kHz.. Control Voltage scaling is 1V/oct. Resonance ("Q") has both a front panel knob and Control Voltage input. All inputs are DC coupled so the filter can process Control Voltages as well as audio signals. The 9730 Modulator is an Attack/Release Envelope Generator with separate Trigger input for A/R envelopes and Gate input for A/R with Sustain (ASR). Attack time is adjustable from 0.5ms to 2 seconds, Release time from 1ms to 4 seconds. The Cycle switch allows self-triggering for an LFO function with independently adjustable rise / fall times and a range from a cycle every eight seconds to over 100Hz. The Gate and Trigger inputs also work when in Cycle mode - a Gate input turns the oscillator off and on and Trigger inputs syncs the oscillator to an external source. The front panel LED brightens and dims to indicate Modulator output. The illustration shows a block diagram of the module. 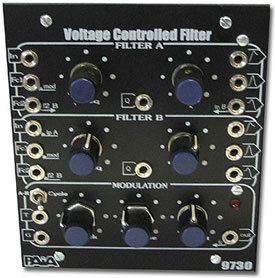 Signal and control flow are normalized for use as a single filter - the A filter LP output internally connects to the B filter input so that a patch cord is not required for this very useful configuration. Similarly, the output of the Modulator routes to Fc of both filters so that no patch cords are required for sweeps or cycling. A single patch cord can apply a CV to both filters for keyboard tracking or other external control. And while the hi-level normalization gives maximum processing power with minimum patch cords, the patch over-ride provisions allow each VCF and the A/R to be used completely independently or in different combinations. If you're a real tech-head, here's the complete schematic. The 9730 has on-board voltage regulators and requires a nominal 18V bipolar supply which need not be regulated. Systems that include a 9700 midi2cv8 MIDI>CV can use it as a power supply for four or five modules and for expanded systems the 9770U power supply is available. Dual VCF Electronics Kit includes all electronic parts, circuit board, switch, controls and knobs. Does NOT include panel or jacks . Got sound samples? Check out the 9730 Dual VCF w/Modulator Test Page. Need a case? Don't forget to order the 9730FRM VCF FracRak Accessory kit. Check out the other modules in the 9700 Series.